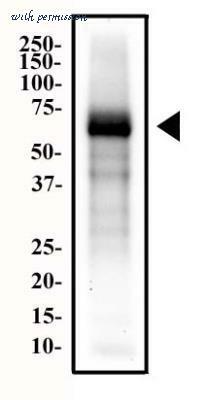 Detection of Human Endoglin/CD105 by Western Blot. Western blot shows lysates of human kidney tissue, human lung tissue, human placenta tissue. PVDF membrane was probed with 0.25 ╡g/mL of Goat Anti-Human Endoglin/CD105 Antigen Affinity-purified Polyclonal Antibody (Catalog # AF1097) followed by HRP-conjugated Anti-Goat IgG Secondary Antibody (Catalog # HAF017 ). 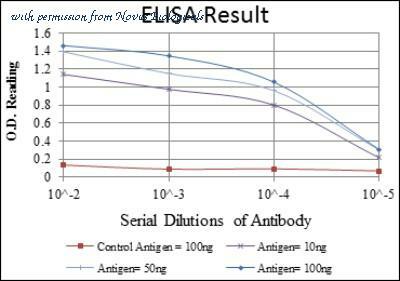 A specific band was detected for Endoglin/CD105 at approximately 90 kDa (as indicated). This experiment was conducted under reducing conditions and using Immunoblot Buffer Group 1 . 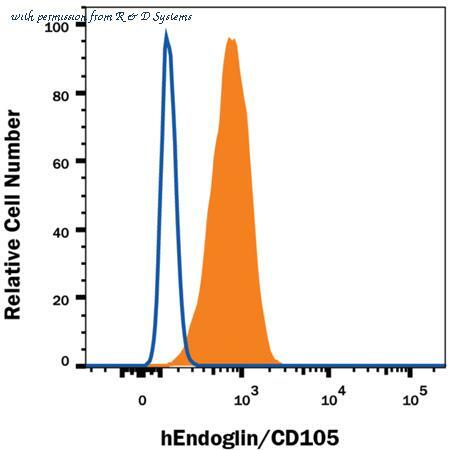 Detection of Endoglin/CD105 in U937 Human Cell Line by Flow Cytometry. 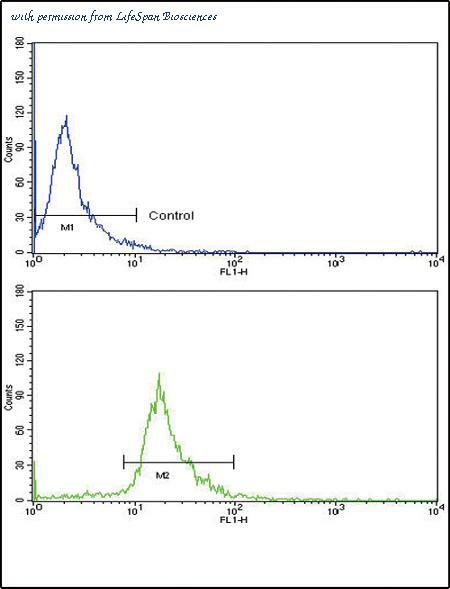 U937 human histiocytic lymphoma cell line was stained with Mouse Anti-Human Endoglin/CD105 PE-conjugated Mono-clonal Antibody (Catalog # FAB10971P, filled histogram) or isotype control antibody (Catalog # IC002P, open histogram). View our protocol for Staining Membrane-associated Proteins . 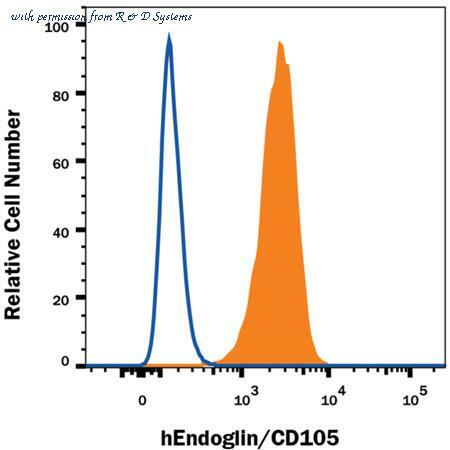 Detection of Endoglin/CD105 in U937 Human Cell Line by Flow Cytometry. 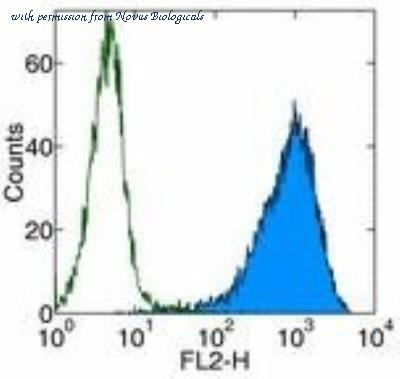 U937 human histiocytic lymphoma cell line was stained with Mouse Anti-Human Endoglin/CD105 Fluorescein-conjugated Monoclonal Antibody (Catalog # FAB10971F, filled histogram) or isotype control antibody (Catalog # IC002F, open histogram). View our protocol for Staining Membrane-associated Proteins . Figure A. FITC conjugated Mouse anti Human CD31 ( MCA1738F ) and Alexa Fluor 647 conjugated Mouse IgG1 isotype control ( MCA928A647 ). Figure B. FITC conjugated Mouse anti Human CD31 ( MCA1738F ) and Alexa Fluor 647 conjugated Mouse anti Human CD105 (MCA1557A647). All experiments performed on HUVEC cells gated on live single cells in the presence of 10% human serum. Data acquired on the ZE5 Cell Analyzer. 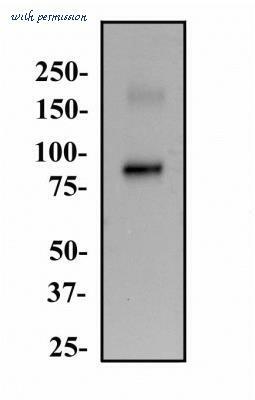 The Endoglin/CD105 antibody from Proteintech is a rabbit polyclonal antibody to a recombinant protein of human Endoglin/CD105. This antibody recognizes human,mouse,rat antigen. 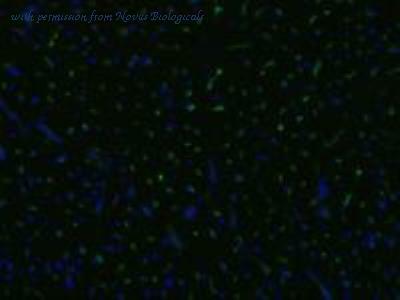 The Endoglin/CD105 antibody has been validated for the following applications: ELISA, WB, IP, IHC, IF analysis. The Endoglin/CD105 antibody from Proteintech is a rabbit polyclonal antibody to a recombinant protein of human Endoglin/CD105. This antibody recognizes human antigen. 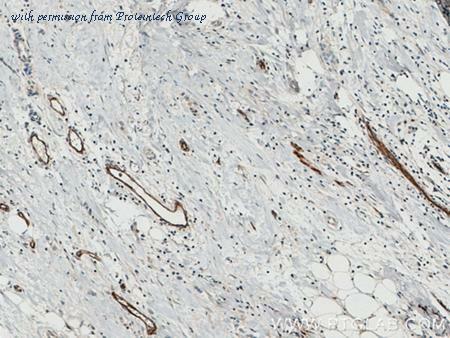 The Endoglin/CD105 antibody has been validated for the following applications: IHC, WB, ELISA analysis. The Endoglin/CD105 antibody from Proteintech is a mouse monoclonal antibody to a recombinant protein of human Endoglin/CD105. This antibody recognizes human antigen. 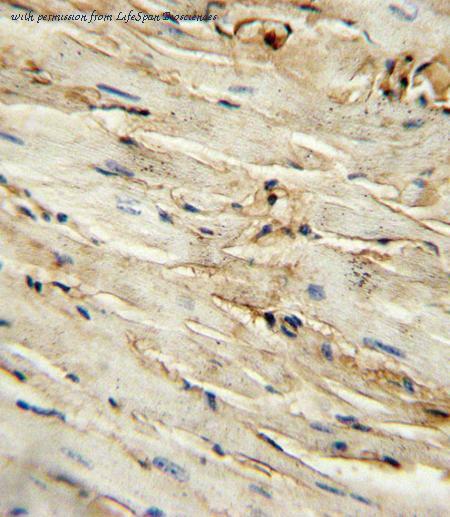 The Endoglin/CD105 antibody has been validated for the following applications: IHC, WB, ELISA analysis. Formalin-fixed, paraffin-embedded human tonsil stained with peroxidase-conjugate and AEC chromogen. Note staining of endothelial cells. Western blot of CD105 antibody (Center E395) in mouse heart tissue lysates (35 ug/lane). CD105 (arrow) was detected using the purified antibody. 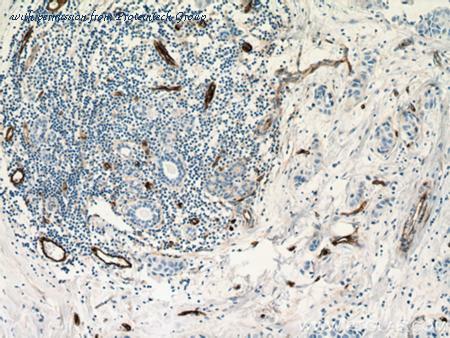 CD105 antibody (Center E395) immunohistochemistry of formalin-fixed and paraffin-embedded mouse heart tissue followed by peroxidase-conjugated secondary antibody and DAB staining. 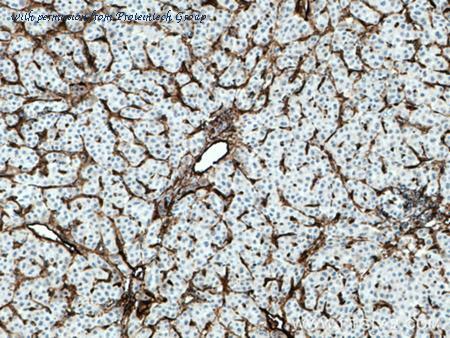 This data demonstrates the use of the CD105 antibody (Center E395) for immunohistochemistry. 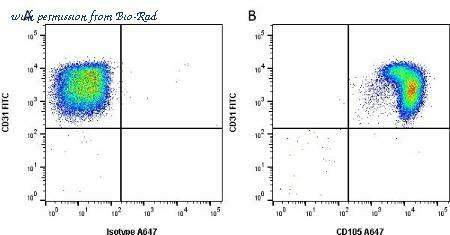 Flow cytometric of NCI-H292 cells using CD105 Antibody (Center E395)(bottom histogram) compared to a negative control cell (top histogram). FITC-conjugated goat-anti-rabbit secondary antibodies were used for the analysis. 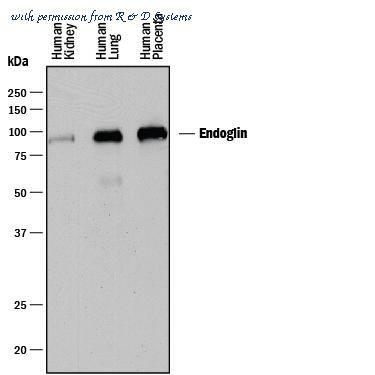 Western Blot: Endoglin/CD105 Antibody (MJ7/18) [NB100-77666] - Total protein from mouse placenta was separated on a 12% gel by SDS-PAGE, transferred to PVDF membrane and blocking in 5% non-fat milk in TBST. The membrane was probed with 2 ug/ml anti-CD105 (NB100-77666) in 1% milk/TBST and detected with an anti-rat HRP conjugated secondary antibody using chemiluminescence. Immunohistochemistry-Paraffin: CD105 Antibody (3A9) [NBP2-22122] - Immunohistochemical analysis of paraffin-embedded kidney cancer tissues (left) and stomach cancer tissues (right) using CD105 mouse mAb with DAB staining. ELISA: CD105 Antibody (3A9) [NBP2-22122] - Red: Control Antigen (100ng); Purple: Antigen (10ng); Green: Antigen (50ng); Blue: Antigen (100ng). 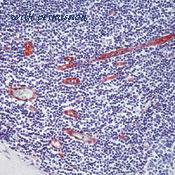 Immunocytochemistry: Endoglin/CD105 Antibody (3A9) [NBP2-22122] - HMSC cells stained with anti-CD105 antibody. Image from verified customer review. 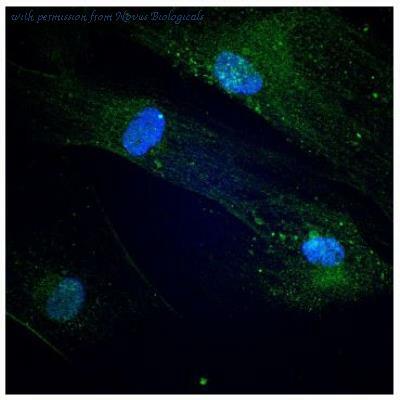 Flow Cytometry: Endoglin/CD105 Antibody (MEM-229) [NB110-58718] - A cell surface stain was performed on HeLa cells with Endoglin/CD105 antibody (MEM-229) NB110-58718PE (blue) and a matched isotype control (orange). Cells were incubated in an antibody dilution of 1 ug/mL for 20 minutes at room temperature. Both antibodies were conjugated to Phycoerythrin.